Wednesday, April 10, 2019, 1 p.m. – 5 p.m. Please check in by 12:40 p.m. near registration on the Marquis Level. Tours will depart the Marriott Marquis promptly at 1 p.m. Please plan to wear closed-toe, flat shoes. 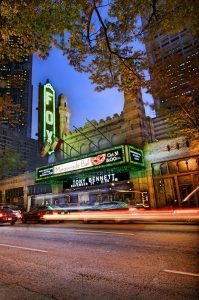 A world-renowned concert and event venue like no other, The Fox Theatre hosts more than 150 shows and welcomes a half million visitors each year. Conceived as the headquarters for the Atlanta Shriners in 1928, the building was designed by the Atlanta firm of Marye, Alger and Vinour to evoke the mystery and magic of the ancient Near East. Completed by movie mogul William Fox in 1929, it flourished as Atlanta’s premier movie palace for the next three decades, showing hundreds of acclaimed films and hosting live performances from legendary entertainers. 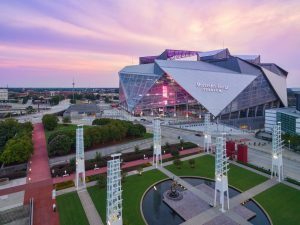 Home of the Atlanta Falcons football team and the most sustainable sports venue in the world, Mercedes-Benz Stadium was the first professional sports stadium to achieve LEED Platinum in the United States. A multi-purpose, retractable-roof stadium, Mercedes-Benz Stadium holds the record for the world’s largest halo board and is one of only five stadiums in the NFL with a retractable roof. The stadium is owned by the state of Georgia through the Georgia World Congress Center Authority and operated by AMBSE, the parent organization of the Falcons and Atlanta United. The total cost was estimated at US$1.6 billion. The stadium officially opened on Aug. 26, 2017, with a Falcons preseason game against the Arizona Cardinals. On Feb. 3, 2019, Super Bowl LIII was played at Mercedes-Benz Stadium. 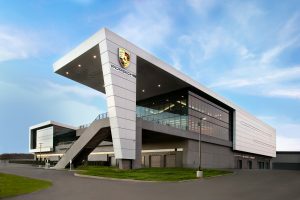 The Porsche Experience Center Atlanta provides a thrilling experience you can only get from an iconic sports car manufacturer. This purpose-built destination is designed to help guests fully explore the abilities of the world’s most exciting sports cars. A 1.6 mile driver development track consisting of six modules combine to create a challenging and exhilarating environment filled with hands-on and fast-paced learning. Visitors can compete on iconic tracks from around the world in the Simulator Lab, or view one-of-a kind vehicles in the Heritage Gallery. Wednesday, April 10, 2019, 1:30 p.m. – 5 p.m. Please check in by 1:00 p.m. near registration on the Marquis Level. Tours will depart the Marriott Marquis promptly at 1:15 p.m. The WE Community will be offering a Wednesday, April 10th morning session at Facility Fusion adding to the value of the facility tour. The session will include Real Estate and Workplace leaders at Coca Cola; Microsoft, and Equifax as they share their most recent projects and key insights. While Troutman Sanders, is one of the oldest, most established law firms in the Southeast US, their new Headquarters clearly expresses the law firm of the future. Join the WE community as Joseph L. Geierman, MCR, CFM, FMP Director, Real Estate and Facilities take us through a customized tour of this exciting new workplace. Working with IA, Joseph and his team successfully integrated emerging workplace and law office trends, into the design of the firm’s headquarters as they relocated to nine consecutive floors within the same building. By taking this approach, they achieved greater real estate efficiencies, promoted activity-based work, and increased staff wellness. Efficient space utilization and flexibility was achieved through universal attorney office and workstation sizes, with paralegals in open plan seating and administrative services centralized at corner resource centers. Staff can gather and recharge at cafés and lounges on each practice floor and the two-floor conference center, connected by a sculptural, interconnecting stair, features expansive views. Authenticity has long been prized at the Coca-Cola Company, starting with that classic “contour” soda bottle that Andy Warhol loved so dearly. “They like to say they’re a curvy company,” Gensler’s design director Michael Lutz explains. He therefore used those curves and other brand hallmarks to reinvent the two lower levels of the buildings that make up the Atlanta headquarters. A ribbon of shared amenities as well as a circulation path, the combined 350,000 square feet represent just one part of a visionary 10-year plan—and also won Gensler’s Design Excellence Award for a large built workplace. The project furthermore included an outdoor component, a central courtyard that, like many similar campus spaces, had once been underutilized, as employees tended to stick to whichever tower they were assigned. The courtyard now pulses with the energy of sinuous islands of vegetation. Back indoors, the ribbon’s lobbies, cafeterias, cafés, corridors, and more have given Coke a fresh public face at an extraordinary scale. Lobbies boast contemporary accents often in red-and-white. A highlight is the main lobby’s pair of spectacular double-height feature walls composed of thousands of disks—red on one side, white on the other—that are individually computer-controlled to flip, displaying different company messaging. “It brings the brand to life,” Lutz says. 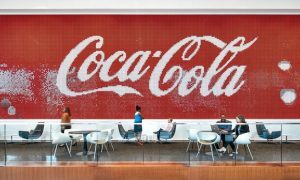 In another lobby, the existing pink stone and pastel-toned tapestries have disappeared to make way for ever changing Coke imagery that appears in waterfalls’ sheets of droplets, thanks to programmed valves.